The Boston Marathon is an annual race hosted by several cities in Greater Boston in eastern Massachusetts, always held on Patriots’ Day, the third Monday of April. The world’s oldest annual marathon begun in 1897 and was inspired by the success of the first modern-day marathon competition in the 1896 Summer Olympics. The Boston Marathon ranks as one of the world’s best-known road racing events and is one of six World Marathon Majors. 9 A.M. – The 2013 Boston Marathon begins. 11:58 A.M. – Rita Jeptoo of Kenya becomes the women’s winner, crossing the finish line with a time of 2:26:25. 12:10 P.M. – Men’s winner Lelisa Desisa, of Ethiopia, finishes with a time of 2:10:22. 2:50 P.M. – Two blasts go off only seconds apart at the finish line, less than 100 yards from each other on the north side of Boylston Street. 3 P.M. – A fire breaks out in the mechanical room at the JFK Presidential Library, but is reportedly not related to the explosions at the marathon. 3:34 P.M. – The Massachusetts Bay Transportation Authority announces multiple sections of the Green Line will be suspended due to police activity. 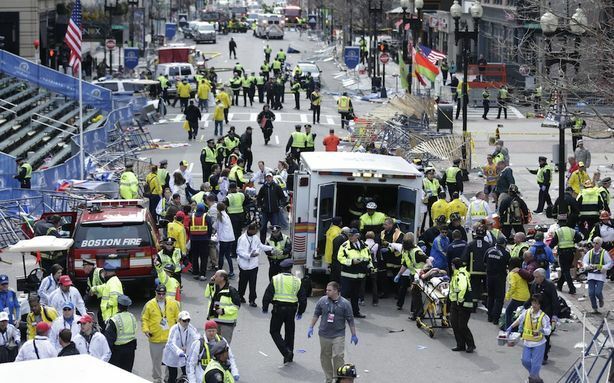 4:02 P.M. – The first official reports from the Boston Police Department list two dead and 23 injured. 4:30 P.M. – A third blast goes off near the JFK Library though no one is injured. Authorities say the explosion is being treated as an “ongoing event”. 4:30 P.M. – Boston Police Commissioner Edward Davis holds a press conference urging people to remain indoors and not congregate in large groups. 5:23 P.M. – The fire in the JFK Library is put out. 6:30 P.M. – One of the dead is reported to be an 8-year-old boy, named Martin Richard.